Famous Smoke Shop, a Pennsylvania-based online cigar retailer, recently launched a new exclusive blend called La Gloria Cubana Gilded Age. Today, courtesy of our friends at Famous, we’re giving away a couple 18-count boxes in the Toro format (6 x 54). 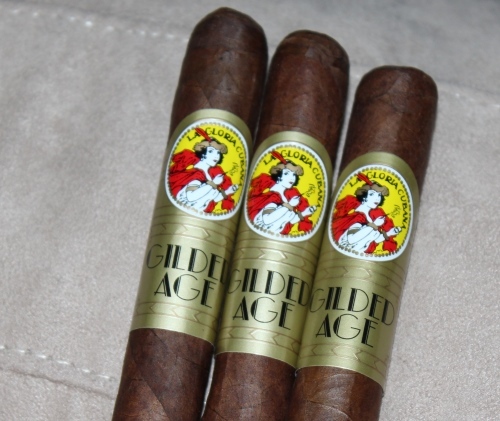 Gilded Age is an extension of the famed La Gloria Cubana brand originated by the legendary Ernesto Perez-Carrillo. It features an Ecuadorian Sumatra wrapper, Honduran binder, and Nicaraguan filler tobaccos of the viso and ligero varieties. Four sizes are available at Famous—Churchill, Magnum, Robusto, and Toro—with singles in the affordable $5-7 range. — Leave a comment below about your favorite experience with La Gloria Cubana. — Make sure you’re registered for StogieGuys.com’s free email newsletter. That’s it (though, if you’re interested, you can read our contest rules and regulations here). Good luck, and special thanks to Famous Smoke Shop for making this giveaway possible. La Gloria Cubana takes me back to my earlier years when I first started smoking cigars. My neighborhood did not have a real tobacconist so I made a special trip to JR Cigars in Paramus NJ. Spoke with a very nice and knowledgeable guy who recommended me to try the LGC. I purchased a 5 pack of the LGC Wavell, and was definitely pleased with my new found discovery! Don't believe I've ever had an experience with LGC, here's to a future experience with them! I don't believe I've tried any of these. Would be a nice time to give them a shot. I had a La Gloria Cubana a month ago on the golf course and it was amazing. I've been considering buying a box ever since. This would be amazing to win. I've also never tried La Gloria Cubanas. Would be great to try these first! My favorite LGC experience involves visiting my Nana in Florida. I was down there visiting for a week and they had a visitor they knew from back in England. He lived in South Carolina at the time and mentioned how he had known my mom when she was alive. He then offered me an LGC and we talked about my Mom. It was a good time. I've yet to try any LGC's as I am pretty new to the cigar world; I've been enjoying them for about 6 or so months. I would love a chance to try these out! Haven't been able to find one of these, but would love to try them. I'm sorry to say my experience with this cigar is sitting in my humidor, but I am looking forward to trying it now more than I was. I've only had limited experience with La Gloria Cubana, but the memory I do have is a great one. A good fried of mind recently accepted a job transfer to a place 1000 miles away from here. Before he left, we decided to have one last cigar – My choice stick for the evening was a LGC Serie R and it was delicious. However, that night was about friendship and quality hang out time more than anything. Thanks for the contest! My favorite La Gloria Cubana moment is my brother's bachelor party. I bought a box of Serie R Maduros and spend the weekend in a cabin with my brother and some great friends, drinking and smoking – it was fantastic! nice looking stick. Would love to give them a try! Best experience, watching Leo Peraza hand roll cigars at the Kentucky Derby, picking up a freshly rolled cigar and enjoying the hell out of it. Thanks for the contest, guys – always appreciated! My favorite experience with LGC was probably my first experience with LGC. Several years ago, a friend had an extra ticket to CigarFest and invited me along. I was an occasional cigar smoker, but by no means an aficionado. I enjoyed the pageantry and picked up enough cigars that I had to go out and buy my first humidor. That night, we went to a cabin we had rented for the weekend, grilled some thick steaks, drank some aged scotch, played poker, and enjoyed that LGC cigar. It was a fantastic experience that set me off on my enthusiasm for the hobby. LGR Serie R was one of the first cigars I really enjoyed when I was first starting out. My favorite experience would have to be trying one of these bad boys in the future! I've only had one or two ever, and though I don't quite recall, I believe they may have knocked my socks off! I've begun making cigars a regular feature at my church's monthly men's gathering. So far it's been a hit. I'd be happy to introduce the men to these. My best memory of La Gloria Cubano is when I first saw them in the humidor when I was first starting to smoke cigars. I had heard a lot about them and couldn't wait to try one. Had a great time with a dad, down the shore on the balcony. My only great memory that comes to mind is smoking one while playing chess with an old man who had beat me every time and I managed to win that game. contests = awesome. first cigar i smoked was a gloria. I haven't tried these yet, should be good if/when I win! A few years back, I ended up with a LGC, the exact line escapes me. I also can't quite remember if I even enjoyed the cigar! But what I do remember is that it was my first cigar with over 4 inches of ash. It was amazing, and I'd love to have an entire box to ash my way through! My friend, Emile, over at McLean Cigars, turned me on to LGC back in the mid nineties when Ernesto Perez-Carrillo was running his own show and producing his best cigars out of Miami. They were hard to come by back then, and his maduros were among the best on the market. I always loved the cigar band and the smokes were just about perfect. If the Gilded Age harks back to that era it would be an improvement over the mass-produced sticks that currently wear the LGC band. Honestly, my first insight into the wonder that is La Gloria Cubana was with a Serie R – No. 7. I had just started the beautiful art of cigars, and I was smoking bottom of the barrel junk, so I five-fingered a LGC from my father in law. With that first draw I was captivated by the complexity of such a beautiful stick. I felt such shame for lifting such a magnificent stogie that I bought him a 24 box of the Serie R – No.7's. To this day we still have a laugh over the dark beauty! If I won these, I would naturally split them with the old man that "introduced" me to the LGC Serie R.
Never had any LGC would love to win. caint wait to smoke some a deez. taint never had onee before. Actually my 1st experience was with a 5 pack of LGC Churchill maduros I bought from FSS. And they were delicious. one of my first premium cigars was a La Gloria! they do make a regular rotation with me. Stay classy! Can't wait to try this one. My favorite La Gloria experience has been enjoying delicious Artesanos de Tabaqueros with my brother. My favorite LGC experience is the time I was fortunate enough to win a 3 pack of them from General Cigar. Sure hope to repeat that here. Thank you for the opportunity to do so. This contest has been closed to new entries as of 11:59 pm on Friday, August 16. We'll be randomly selecting two winners, notifying them, and sending them their boxes. Good luck, and thanks to everyone for participating. I smoked my first LGC not that long ago really. It was a Wavell, and I did my first ever, written review on it. So, the LGC is a brand I will always remember. Thanks, Patrick, for a great contest and to Famous Smoke Shop for kindly providing the prizes. I can't believe I won, and I look forward to trying them out and sharing them with some folks I know who would like to try them, too. LGC makes some really fine cigars, thanks for the contest!